A timely recovery from a life changing event such as an injury, illness, or surgery is often determined by the quality of care received during recuperation. Rehabilitation Services at Camden Clark Medical Center exists to provide patients, families, and caregivers with the resources, training, and support needed to best guide them through the recovery process. While working together with our patients and their physicians, we provide the level of care our patients need and closely monitor their progress. We help our patients emerge with confidence to get their lives back on track as quickly as possible. All of our highly skilled staff are licensed in their respective fields and work together with the common goal of achieving optimal outcome for all of our patients. Physical therapy provides evaluation and treatment to help restore function, improve mobility, relieve pain, reduce edema, and prevent or limit permanent physical disability. 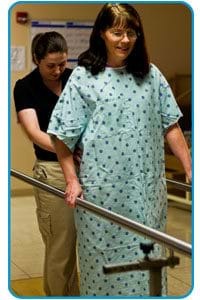 Our PT services address impaired range of motion and flexibility, poor balance, decreased strength, decreased endurance, pain management, decreased function or independence, and impaired ambulation or gait. Services are available to all ages and focus on developmental, neurological, orthopedic, respiratory, cardiac, bariatric, and general debility diagnosis. 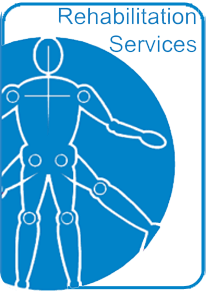 Modalities and specialties include total joint rehabilitation, back/spine rehabilitation, passive and active range of motion, gait/balance training, therapeutic exercise, electrical stimulation, ultrasound, therapeutic modalities, and customized education programs. Our staff includes licensed physical therapists and licensed physical therapist assistants. Occupational therapy provides evaluation and treatment to help patients improve their ability to perform tasks in living and working en vironments. Occupational therapy gives people the “skills for the job of living.” Our OT services address therapeutic exercise to restore coordination, strength, and mobility necessary to perform the activities of daily life. Services are available to all ages and focus on developmental, neurological, upper extremity orthopedic, respiratory, mental health, and general debility diagnosis. Modalities and specialties include activities of daily living, instrumental activities of daily living, visual perceptual activities, cognitive retraining, compensation techniques, electrical stimulation, ultrasound, upper extremity splinting,fluidotherapy, hand therapy, and customized education programs. Our staff includes registered occupational therapists and certified occupational therapy assistants. Speech therapy provides evaluation and treatment to help patients communicate and swallow. Our ST services address disorders of motor speech, language comprehension and expression, cognition, voice, fluency, prosody, and swallowing. Modalities and specialties include aphasia, apraxia, dysarthria, dysphagia (swallowing), modified barium swallow assessment and interpretation, “Vital-Stimulation,” Deep Pharyngeal Neuromuscular Stimulation, laryngectomy care, Tracheo-Esophageal Puncture with voice prosthesis, ventilator care and Passy-Muir speaking valves, cognitive recovery from brain injury and stroke, and customized education programs. Our staff includes licensed and nationally certified speechlanguage pathologists.